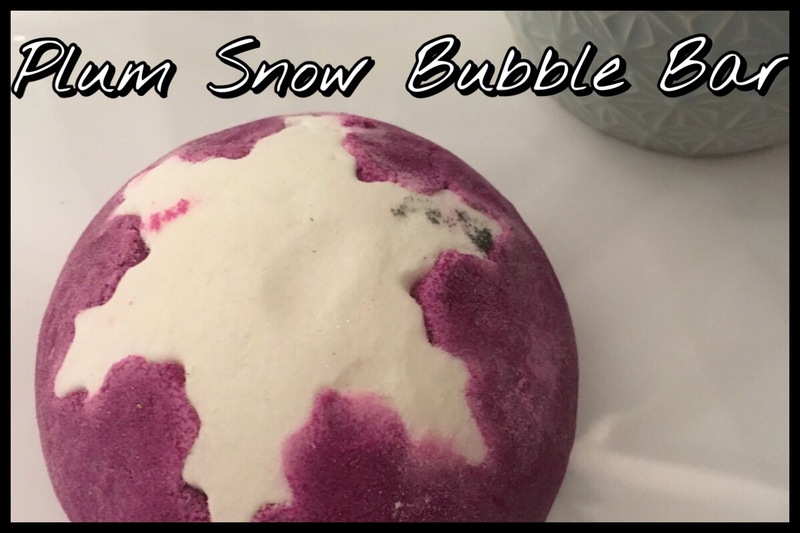 With the days getting colder it’s perfect bath weather and, having bought it in a recent haul, I decided to give the Plum Snow Bubble Bar from the limited edition Christmas range in Lush a go. This is a fair sized bubble bar, I used half for one bath but I can see it lasting for up to four if you’re careful with it. It costs £5.95 but is definitely bigger than the standard bubble bars Lush do. Scent wise this is the same scent as the products in the Plum Rain scent range, just the solid bubble bar version rather than the shower gel that was available or the current body spray. I think it’s also the same scent as the sugar plum lip products, it definitely smells the same as the lip tint I got last year to me, but I’m not 100% sure on that one. I love the look of this bubble bar, it’s such a bright colour and the snowflake design in the top stands out. You do have to be slightly careful if you put it down in anything thing might absorb any damp as it does seem to leave a bit of a purple mark sometimes, but storing it in a freezer bag or wrapped in kitchen roll works well to stop that. The snowflake doesn’t go all the way through, I broke it in half to see how far it went, but it’s all the same scent so it doesn’t make much difference if the snowflake on yours goes deeper or not. 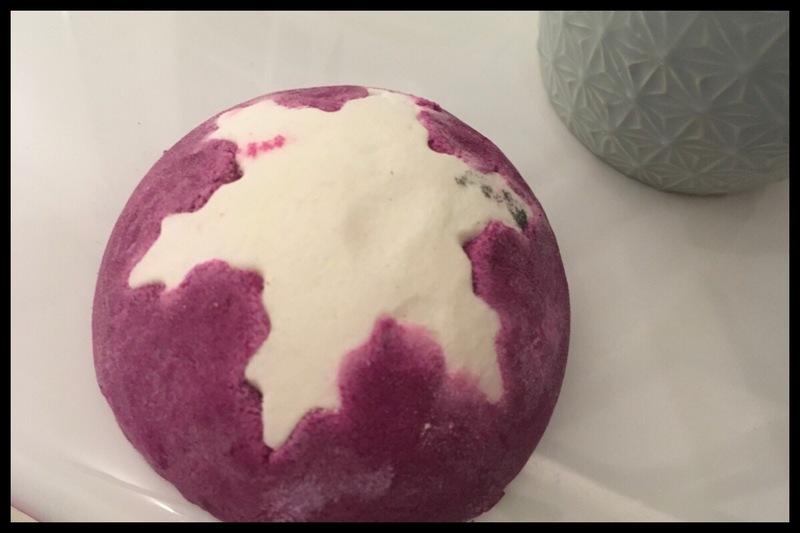 The same bright purple colour translates well into the bath water itself when it’s all dissolved. I don’t know how common bubble bars are but if you haven’t used one before they are basically solid bubble baths that are supposed to be easily crumbled under running water to give you a nice bubbly bath. There have been problems in the past with Lush bubble bars being rock hard and people having to use a cheese grater is smash them to use them. Luckily this one doesn’t seem to have the problem, I’ve had it for a while and it’s still nice and crumbly, but I wouldn’t advise stashing bubble bars too long because of this. As far as the bubbles go the half I used was more than enough. They’re nice and soft bubble that last ages, there was over half a bath full of them when I got out at the end, and a quarter of one of these would be enough for a nice bubble bath without being taken over by foam. I really liked how the water seemed to soften my skin, it tends to be dry and there was no need to slap moisturiser on straight afterwards like I sometimes do, but also without an oil slick feeling or making my hair oilier which also seems to happen at times. 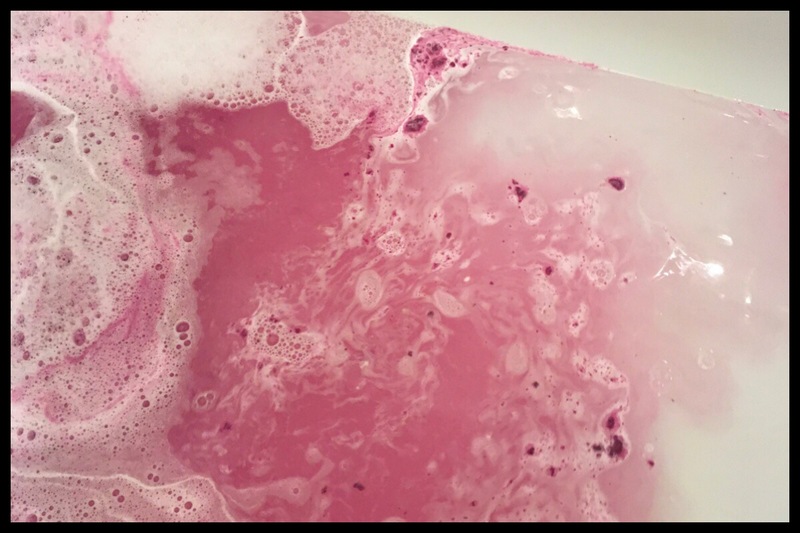 The scent for this, and the plum rain range in general, is definitely not the super sweet scent I tend to think of when I see plum in a bath product description. It has some sweetness but there’s definitely a sharpness in there which reminds me of the plums we used to have in our garden. It’s the kind of taste you get when they’re not quite ripe but still nice enough to eat, with a bit of tartness that leaves you feeling refreshed. I hope that makes sense. Basically I think it’s one of those scents that’s fairly inoffensive to anyone, it’s not overly sweet so people who hate scents like snow fairy won’t be put off but it does have a fruitiness that a lot of popular scents have. I think that, of this years Lush Christmas offerings, this is one of those products I would consider stocking up on in the sales. It’s a cone scent, lasts well and the bubbles are really soft and relaxing. The scent doesn’t linger on your skin but it does last in the bathroom band spread in the upstairs landing for hours later. 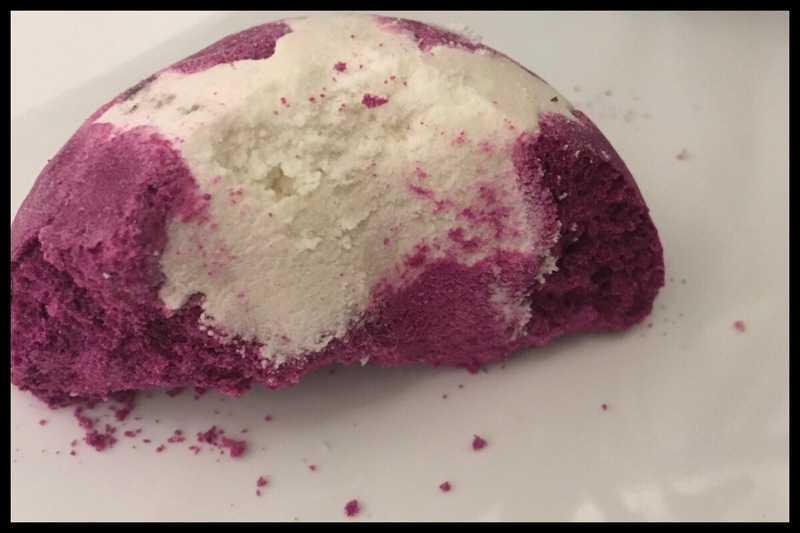 If you haven’t tried Lush bubble bars I’d say this might be a good one to try, it was easy to crumble and I haven’t seen any of these that have gone hard so I think the formula seems to be working for them. I’m surprised how many bubbles this created! And only half the bar too. I haven’t checked out LUSH’s Christmas selection this season yet – I probably should go have a look. I LOVED the smell of the Snowcastle soap from last year. Was that the almondy soap? They always do a snowcake one in almond and I think it was a castle last year. I’ve got a bit out of touch with lush things over the past few years, I used to try everything! This bubble bar is definitely worth the money if you like the scent. There’s a couple of the products I have from the Christmas range I’m less impressed with but haven’t tried yet, I should soon though as they’re getting worse the longer I keep them.